AdoredTV's proposed Ryzen lineup looks quite optimistic, but keep in mind that the original Ryzen CPUs lowered the entry level for octa core CPUs from $1000 to just $300. AdoredTV is well known for his previous leaks on AMD's upcoming Rome server CPU and Nvidia's current gen Turing GPUs. It's not entirely surprising that he has come across some information which he once again recommends we take with a grain of salt. After leaking information (that mostly ended up being true) on both Rome and Turing, YouTube based tech analyst AdoredTV claims to have obtained a lineup for the Ryzen 3000 series which he believes is within the realm of possibility. However, he (and we here at Notebookcheck agree) has stated that this leak should be taken with a grain of salt since it's not totally verifiable. Anyways, the specifications the analyst has obtained are truly amazing: at the high end, $500 for AMD's best 16 core (not a typo) CPU, in the mid range $330 for the best 12 core or $230 for the best 8 core, and at the low end $130 for the best 6 core. AdoredTV also claims AMD's lineup will feature APUs with up to 20 Navi based CUs, almost double the highest end APU the 2400G. 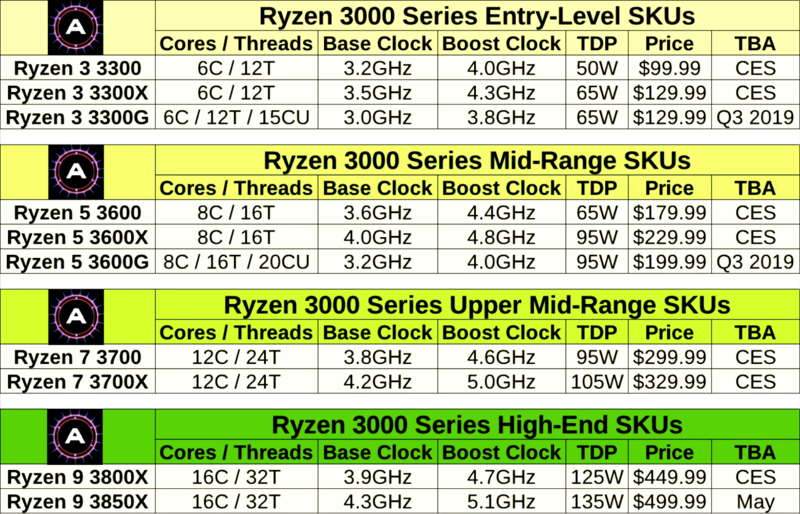 Even more incredible are the clock speeds, with the 3850X (or 3850A since it's rumored to come out in May right in time for AMD's 50th anniversary), capping out at a 5.1 GHz boost clock, which is even faster than Intel's 9900k which has half the cores and costs more. Several other CPUs are rated for 5 GHz or just under. While this all seems too good to be true, Kyle Bennett from HardOCP, who broke the story on Nvidia's infamous Geforce Partner Program, says most of AdoredTV's information is correct. These clock speeds are also within the range AMD said 7nm would be able to boost to. Again, it does seem too good to be true, but that's what many said about the original Ryzen line up, which were very competitive even at launch in all but one aspect, single thread performance. 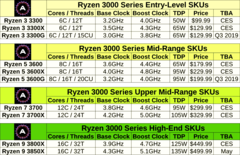 If these specifications are accurate, it would mean AMD would probably close the gap with Intel, which has enjoyed a near 20% advantage in clock speed and consequently single threaded performance. It would be hard to recommend Intel CPUs if these parts materialize.